My favorite spot is on the grassy bluff overlooking the surf at Coast Boulevard Park, just south of the backside of the Museum of Contemporary Art in La Jolla. My husband and I picnic there year round; it’s where he proposed all those years ago – and where we opt to renew our contract each year on the anniversary of that date. 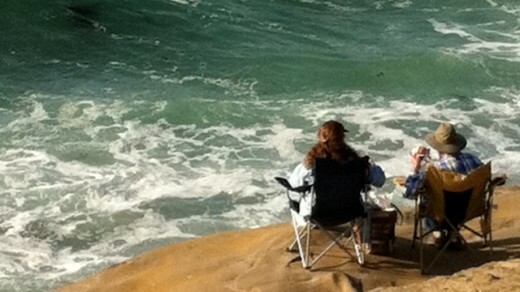 At low tide, some take their picnics to a wide patch of bluff closer to the surf. From any vantage point, the view is breathtaking. Want entertainment with your picnic? Check out parks throughout the county where free concerts will be staged this summer. We blogged about them last month. Prime spots for picnics with fireworks viewing include Rose Marie Starns South Shores Park on Mission Bay. The sandy beach has fire rings – and a perfect sight-line for watching SeaWorld fireworks. For music and fireworks, spread a picnic blanket at the tip of Embarcadero Marina Park North when Summer Pops is on stage at the tip of Embarcadero Marina Park South. Balboa Park is filled with great picnic spots. After visiting a museum or two, generations of local families have picnicked at Pepper Grove, south of The Fleet along Park Boulevard. The big draping pepper trees remain – and there’s a large playground and 15 picnic tables. In East County, Santee Lakes is a 190-acre recreation preserve with seven lakes, a 300-space RV campground, cabins for rent – and plenty of fun for picnickers. Go fishing. Rent a pedal boat, rowboat, canoe or kayak ($11-$15 per hour). Kiddies can romp at five playgrounds (each geared for specific ages). 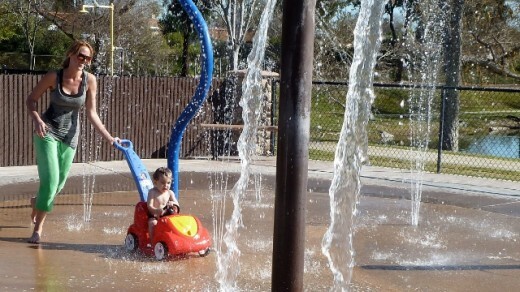 The “Sprayground” is wet and wild fun for kids up to 13 years old. (Pay $2 at the front gate for a wristband and get soaked all day long.) Technically admission to the park is free, but parking costs $5 on weekends, $3 weekdays. Want to extend your picnic? The park has 10 new cabins for rent – including three floating units. Each has an equipped kitchen and can accommodate up to six – but you’ll have to bring your own linens. Rates start at $100 per night midweek for lakefront units and go to $145 a night for a floating cabin on weekends and holidays. There are two swimming pools and a whirlpool spa exclusively for overnighters – including the many snowbirds who rent RV spaces by the month. You have a favorite picnic spot we haven’t included here? Please tell us about it. This entry was posted in Culinary, Family Vacations, Outdoor Adventures and tagged balboa, bay, Cabrillo, east county, fireworks, mission, park, parks, picnics by Alison. Bookmark the permalink. I love your story about Coast Boulevard South in La Jolla and will think about it every time I walk that way. Isn’t that right next to the Wedding Bowl? How appropo. My favorite La Jolla picnic spot is the Gliderport because it has a fab view back to the village and The Cove and offers the constant “entertainment” of hang gliders and paragliders taking off and landing. The sight of the colorful sails against the blue blue sky takes my breath away.